Travellers who have booked low-cost Norwegian to travel London Gatwick to New York JFK are in for a treat. The carrier has confirmed that it has chartered an A380 aircraft to operate on its 1705 departure from Gatwick to New York JFK during August, to help it cope with capacity issues caused by ongoing (and industry wide) problems with the B787 Dreamliner engines. “We have hired a Hi-Fly A380 to operate our evening London-New York service for several weeks in August as continued issues with a specific Rolls Royce engine type affecting our 787 Dreamliner fleet has reduced our aircraft availability, this is in line with other airlines that have been affected by similar problems. So instead of dense economy seating on Norwegian’s B787, passengers on the evening departure will find themselves on Hi-Fly’s more spacious A380. Why do I say “spacious.” It’s simply because Hi-Fly’s A380 was previously operated by Singapore Airlines (SIA). And Hi-Fly has retained SIA’s roomier cabins. Norwegian is not directly highlighting the business and first class offering on the superjumbo aircraft, but Business Traveller understands that both cabins will be used on the flights, meaning certain lucky Premium passengers may find themselves in a first class suite or fully flat business class seat for their transatlantic trip. Hi Fly took delivery of its first ex-Singapore Airlines A380 last month, and unveiled a special coral reef themed livery in support of the Mirpuri Foundation “Save the Coral Reefs” campaign. Note that while the A380 has significantly more seats than Norwegian’s B787 aircraft normally serving the route (471 compared to 344), the carrier is not currently selling the extra capacity. At the moment these flights are simply shown as “Sold Out” with the aircraft type removed. One flight was cancelled yesterday (see below) and the carrier is anxious not to cancel more flights, hence its move to secure the A380. 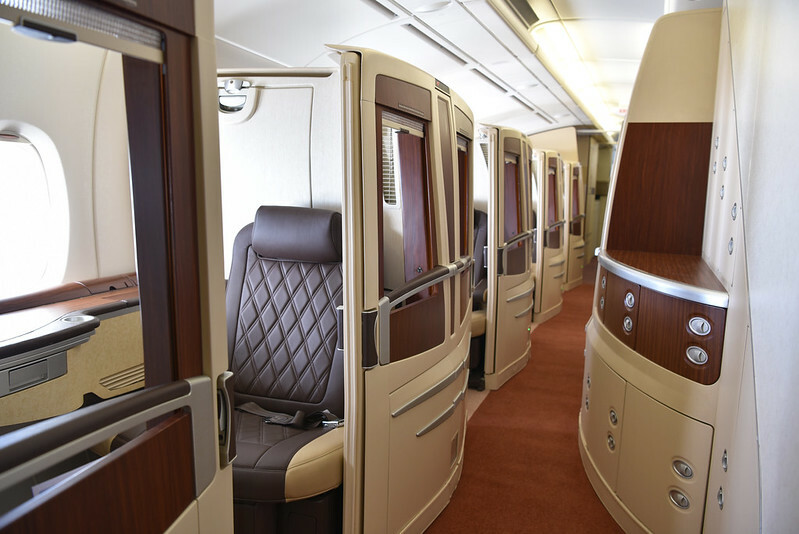 On the ex-SIA A380, business class is configured just 1-2-1 on the A380’s upper deck and seating is lie-flat. The A380 is being flown from Oslo To London Gatwick as a ‘ferry flight’ ready for the afternoon departure for New York today. Norwegian will be only the second carrier to charter Hi-Fly’s A380. The latter’s first customer was Thomas Cook (Scandinavia) who used it just a couple of days ago for charter flights between Copenhagen and Larnaca (Cyprus) returning to Oslo. After Norwegian it is expected the A380 will find service with France’s Air Austral. French media speculates this independent airline will roster the A380 on a number of dates in late August and early September between Paris CDG and La Reunion.